^_^ Hi everybody, welcome back again to my little corner of the internet. It’s been a long week, and once my 7 day in a row work-a-thon was over, I could finally press forward with the custom order iphone 6plus case. The top left hand corner’s image is the logo of Japanese boy band Arashi, and of course the other two are from Mario Brothers. They have not been properly domed yet so they will appear much much shinier after that part of the process. This is it! I really really hope she likes it. 🙂 I tried not to go too overboard this time around and keep the theme of Swords and Sweets. 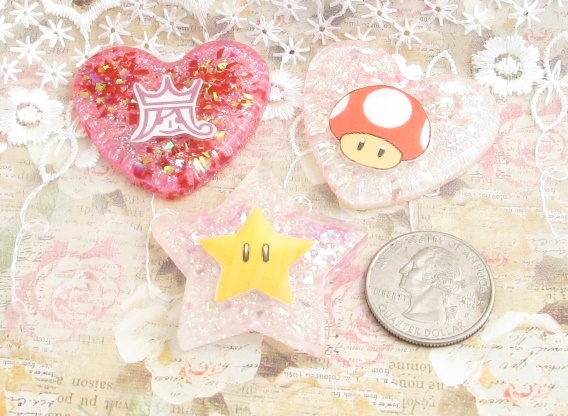 The clay pieces, resin pieces, and painted cabochons will be coated in resin either tomorrow or sometime within the next couple of days The resin coating makes the case’s pieces incredibly durable AND stand out like shining diamonds. I will post a pic when that process is complete and cured as well. Special Guest Phone Case Appearance: Cam Case Take 2. This is a custom order for a friend of mine. 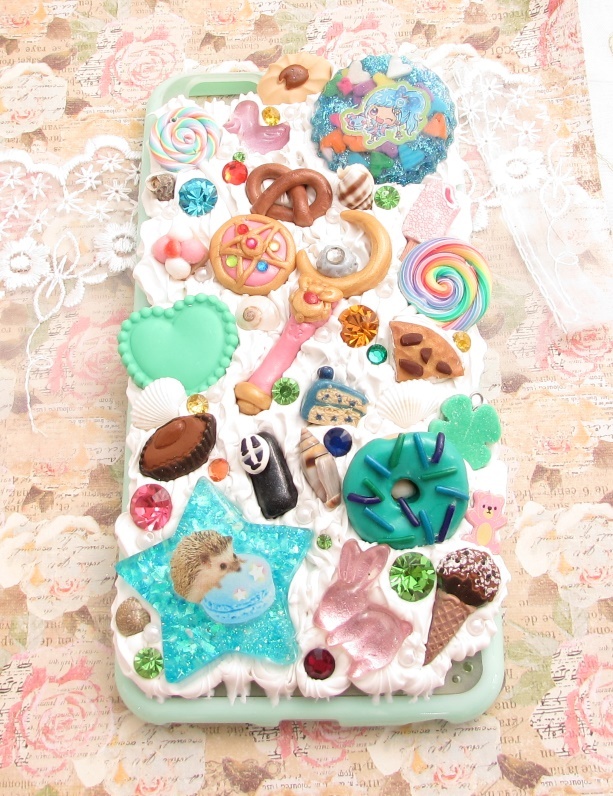 The last case I made for her went up on my etsy as “Going off the Rails of a Crazy Case” because it just ended up looking like… too much, a mess, and it didn’t really fit her personality. 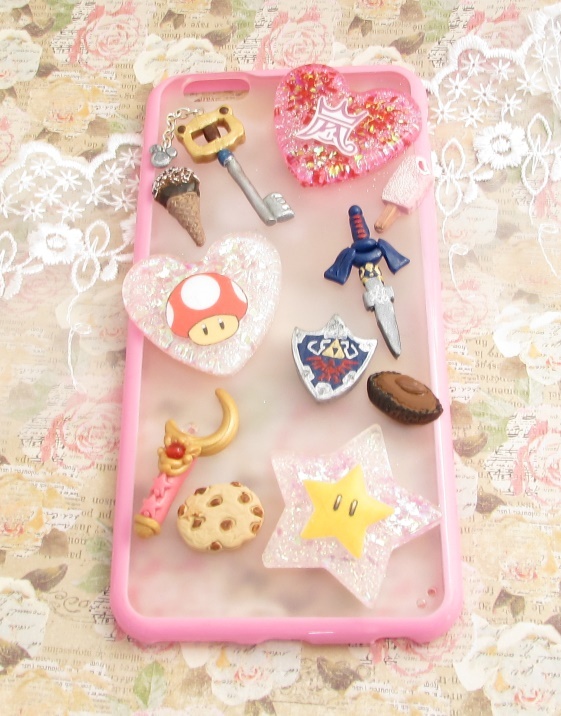 I put the case on Etsy just in case (haha) someone else might like it. You know what? It sold less than a week later. :O Totally surprised me but I was thankful nonetheless. 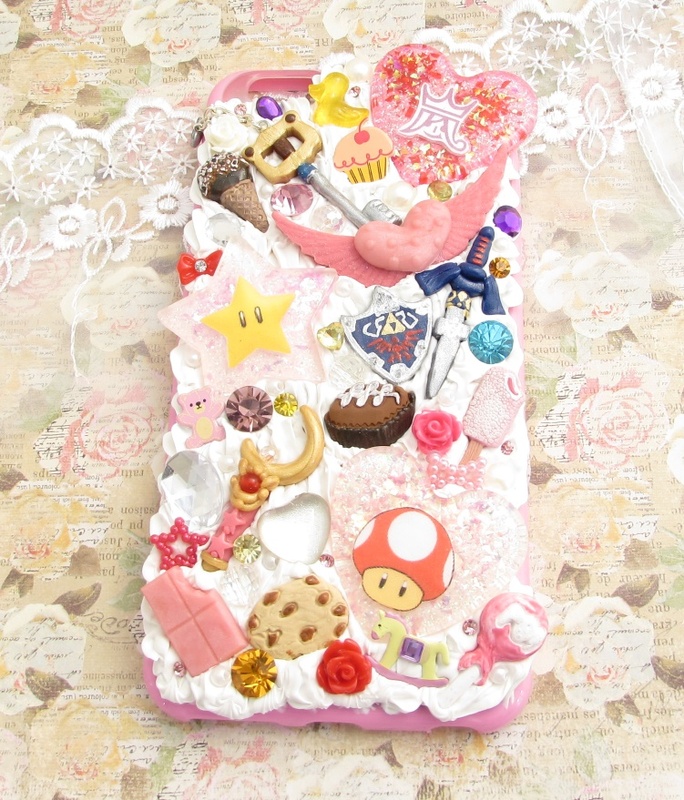 What’s special about this case is that I used a lot of little pieces that I had made when I was first starting out kawaii crafting. The moonstick, brooch, pretzel, cake slice, donut, No Face and lollipops are all some very first attempts and I thought she might appreciate getting a little slice of history on her case. It also has some tiny seashells because she lives on an island and loves that island life. :p Hope ya like it, chica! Stay tuned for next week when we see what the cases will look like with their cabochons sealed in resin!